Welcome to the University of Belize, the country’s National University and your partner in development through higher education. Whether you are here to get an associate’s degree, a bachelor’s degree, a certificate, or to upgrade your professional skills and pursue personal interests, UB can assist you to succeed. With campuses in Belmopan, Belize City, Central Farm, and Punta Gorda and research stations on Calabash and Hunting Cayes, UB makes the effort to provide education and services where they are needed. Currently we have nearly 5,000 students in a variety of programs in our Faculties of Education and Arts; Management and Social Sciences; Nursing, Allied Health & Social Work; and Science and Technology. Our staffing comprises of 138 academic and 326 administrative and support staff. These are complemented by adjunct lecturers. We are developing online courses and have introduced a virtual library base that gives students and faculty throughout the UB system access to nearly 20,000 academic titles and 700 journals. As a student centered university, UB is investing in providing services critical to your success as a student. Student support systems include scholarships, student housing, intramural sports, daycare facilities, counseling services, and wellness centers, to name just a few. In the years ahead we will be working harder to enhance these services. At UB we are proud of our expansive and rigorous curriculum, as well as the many opportunities for learning that we offer outside the classroom. Small class sizes, low student-teacher ratios, and the availability of UB lecturers to engage you in academic advising and in personal matters will facilitate your educational experience. University discourses on topical matters, the opportunity to participate in university research and outreach projects, field courses and internships will ground your learning in real world experiences and will better prepare you for the world of work. Education is a journey, and the UB team is committed to ensuring that you arrive at your destination, that you have a memorable experience, and learn more about yourself and your world along the way. Administrators, faculty, and staff at UB realize that education is more than a series of classes, reading assignments and exams. Education is the vehicle for personal and social development and the means whereby students examine values and forge their identities, becoming successful individuals and contributing members of their societies. On behalf of the entire university community, thank you for choosing the University of Belize. As President of UB, I have been saying “our students are first,” as we value your presence and confidence in us. We are excited you are here, and we look forward to helping you on the path to achieving your dreams and a bright future. Professor Clement Sankat was appointed by the Board of Trustees of the University of Belize as its 7th President on February 15, 2017 and in the same year was appointed Professor (Emeritus) by the University of West Indies (UWI). Since his appointment at the University of Belize (UB), Professor Sankat has led the drive for the transformation of the University through a plan entitled, “Transformation Leap – Vision 2022”. This is a steady work in progress. Professor Clement Sankat, retired as Campus Principal of The University of the West Indies, St. Augustine Campus in September 2016. He was a member of the Executive Management Team of The University of the West Indies (UWI). He has served in the position of Campus Principal from 2008 to 2016. During his tenure as Campus Principal, his focus was on building the capacity, quality, sustainability and reach of the St. Augustine Campus of The UWI. He was a senior member of academic staff at the Department of Mechanical and Manufacturing Engineering of the Faculty of Engineering, UWI, St. Augustine Campus and is a registered professional Mechanical/Agricultural Engineer with the Board of Engineering of Trinidad and Tobago. He holds a Bachelor’s Degree (First Class Honours) and a Master’s in Mechanical Engineering from The UWI and a Doctorate from the University of Guelph’s School of Engineering in (Canada). He is a Chartered Engineer (CEng), a Fellow of the Institution of Agricultural Engineers (FIAgrE) of the UK and a Fellow of the Association of Professional Engineers of Trinidad and Tobago (FAPETT). Professor Sankat was a graduate of Queen’s College in Georgetown, Guyana. He was the recipient of a Government Scholarship for undergraduate engineering education, and was the winner of the Sir Solomon Hochoy Award for best Mechanical Engineering Student at the UWI in 1972. He received a UWI post graduate scholarship for Master’s research, a CIDA scholarship for Ph.D studies in Canada and an NSERC Research Associateship in Food Engineering at Laval University in Quebec, Canada. 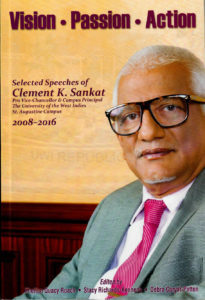 For more than thirty years, Professor Sankat was engaged in Departmental, Faculty, Campus and University administration and leadership at The UWI. He is a former Head, Department of Mechanical Engineering, Assistant Dean, and Dean of the Faculty of Engineering (2000-2007), Campus Coordinator for Graduate Studies and Research at St. Augustine, Pro-Vice Chancellor for Graduate Studies and from January 1st 2008 to July 31st, 2016, the Pro-Vice Chancellor and Campus Principal, UWI, St. Augustine. He has been steadfast in supporting student-centredness, research and development, graduate-level training and in building capacity, promoting quality and accreditation for engineering education in particular at The UWI and in the Americas. Under his watch, the St. Augustine Campus was granted institutional accreditation for the very first time and for a full term by the Accreditation Council of Trinidad and Tobago (ACTT). His teaching, research and development and professional interests are in the areas of Processing/Storage of Tropical Crops and Food Engineering, Engineering Graphics and Machine Design and the Management of Innovation. 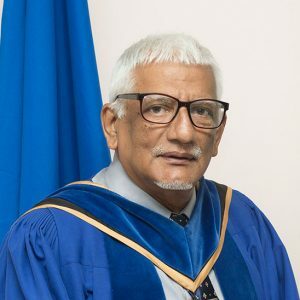 Professor Sankat was the first engineer to be promoted to a Readership in the Faculty of Engineering, UWI and was subsequently promoted to a Personal Chair in the Department of Mechanical Engineering. His research and developmental work in the areas of Caribbean Food and Agro-Industrial Development has been published in the leading international and regional journals in the field such as: Transaction of the American Society of Agricultural Engineering; Canadian Agricultural Engineering; International Journal of Food Science and Technology; Post-Harvest Biology and Technology; Food Research International; West Indian Journal of Engineering; Tropical Agriculture and ASEAN Food Journal. Professor Sankat has more than a hundred published papers to his credit. Much of this has been achieved through his direction of graduate research students at the Masters and Doctoral levels and through external research grants. Some of his work has gone beyond academia and has been extended and applied in the food and agricultural industries. He is committed to bringing technology and innovation to bear on food and agricultural production in the Caribbean. Professor Sankat has for many years been actively involved in the application and promotion of Science and Technology (S&T) for national and regional development. He was a long serving member on the Board of Directors of the Caribbean Industrial Research Institute (CARIRI) and previously served as the Institute’s Chairman. During his tenure as Chairman of CARIRI, Professor Sankat led the drive to re-focus and re-engineer the Institute with a strategic vision of business service and self-sufficiency. He was also a previous Chairman of the Trinidad and Tobago Bureau of Standards (TTBS). Under his leadership, The Bureau became engaged in a programme of physical and service expansion so as to better meet the needs of the business and manufacturing community. He has served as a Member of the Board of Directors on the National Institute of Higher Education, Research, Science and Technology (NIHERST), and was instrumental in the development of a Draft National Policy on Science and Technology for Trinidad and Tobago and the author of a report to refocus and reengineer the Institution. He was appointed as Chairman of the Vision 2020 Sub-committee on Science, Technology and Innovation for Trinidad and Tobago and was the lead author of the Committee’s final Report. He served on the Board of Directors of the Metal Industries Company Limited (MIC), as Chair of the Board of the Arthur Lok Jack Graduate School of Business (ALJGSB) and The UWI School of Business and Applied Studies Limited (ROYTEC). He currently serves on the Board of Directors of Turneffe Atoll Sustainability Association (TASA) and the Protected Areas Conservation Trust (PACT) in Belize. For his efforts in Public Service, University Service and Research, he was awarded in 2001, The UWI Vice Chancellor’s Award for Excellence. His accomplishments were also formally recognized by the University of New Brunswick which conferred on him an Honorary Doctoral Degree in 2010. He was also recognized by the Association of Professional Engineers of Trinidad and Tobago (APETT) in 2010 with the Career in Excellence Award and was the recipient of the Cacique Crown of Honour (CCH) at the Investiture Ceremony in Guyana in October 2011. In 2012, Professor Sankat was awarded the Gold NIHERST Award for Excellence in Science and Technology and in 2013, he received an award from the Hindi Foundation of Trinidad and Tobago for his contribution to education. In addition, he received the International Society for Horticultural Sciences award for his commitment to excellence for pioneering research in Controlled Atmosphere Storage of Tropical Commodities. He also received the Caribbean Food Crops Society Honour for leadership and commitment to developing the Society and the Paul Harris Award for work in Education from the Rotary Club of St. Augustine. In 2013, Professor Sankat was also recognized as a Fellow by the Canadian Society for Biological Engineering. Professor Emeritus Clement Sankat’s Professional Profile can be downloaded here: PROFESSOR SANKAT – Academic Profile. *President Sankat’s research profile can be found on Google Scholar and Research Gate.